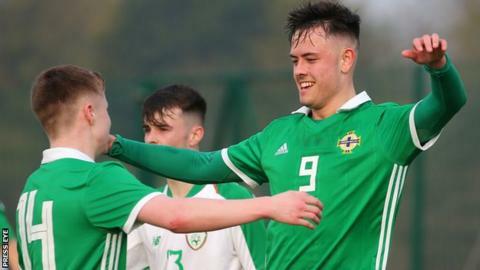 Northern Ireland Under-18 Schoolboys have won the Centenary Shield following a 3-1 win over the Republic of Ireland. Frank Wilson's side only needed a point from the final match to lift the trophy but finished their unbeaten campaign with an emphatic victory in Belfast. Striker Callum Ferris scored twice after Andrew Whiteside's opener to seal NI's sixth outright title, having also shared the trophy on two occasions. Substitute Ross Tierney scored the only goal for the Republic. The win at Queen's University Belfast's Dub complex rounded off an impressive tournament by Wilson's team, which also featured wins against Wales and Scotland and a scoreless draw with England at Redditch. Northern Ireland had previously won the Centenary Shield outright in 1996, 1998, 1998, 2011 and 2013 and also shared the title in 2005 and 2009. Forwards: Calvin McCurry (De La Salle Belfast/St Oliver Plunkett), Callum Ferris (NIFL Academy/Portadown).